These Caravan polyesters sidewalls just can't be beat for quality construction and value. This 15 ft. sidewall is constructed with 100 percent 500 denier polyester fabric for long life and strength, and meets the CPAI-84 fire resistance code for standard safety. Simply secure these 15 ft. sidewalls to your frame with the attached velcro fasteners to have the length that suits your needs. These sidewalls also come with zippers attached to the vertical edge of the sidewalls so you can easily connect them to each other. Price given is per sidewall. We have an indoor show choir contest and use 2 10' x 15' popup tents as dressing rooms. We had two of these tents donated to us recently. They did not come with side walls. I need one 10 ft sidewall and one 15 ft sidewall for each tent and they need to be black in color. The brand of the tents we have is Delta. That company only makes a thin side with windows for their tents. I was wondering if the Caravan sidewall would work for these tents. I was also told that you usually have discounts on a regular basis. Thank you. As a former show choir member turned CSR, I was excited to get your question. Unfortunately, sidewalls (and almost all other canopy accessories) are going to be manufacturer specific. Caravan walls will not work on a Delta model. I would suggest asking Delta if they might have something more suitable for your needs. We do run sales and promotions frequently. Please join our email list to stay in the loop. I have a Caravan 10 x 15 tent. Is this for all of the sidewalls for this tent or just (1) 15' sidewall? This is for one side wall only. Can i use these sidewall on a 10x15? 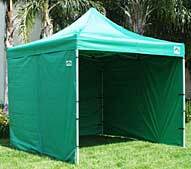 Only on the Caravan brand 10 x 15 pop up canopy. The are not designed for use on any other brand. This was great as an add on unit.